Tekmars newest addition to the TOC analyzer product line, the Torch, utilizes a patent pending Static Pressure Concentration (SPC) for the analysis of TOC/TN using high temperature combustion. 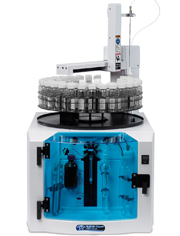 The Torch Analyzer contains a built in autosampler with three vial rack choices and PC driven control. This features automated calibration and Intellidilution which automatically dilutes over-range samples to within the working calibration range. Maintenance is simplified by design allowing easy access to all areas of the unit. All of these features and competitive price positioning make this system ideal in keeping costs down and maintaining productivity in the laboratory.